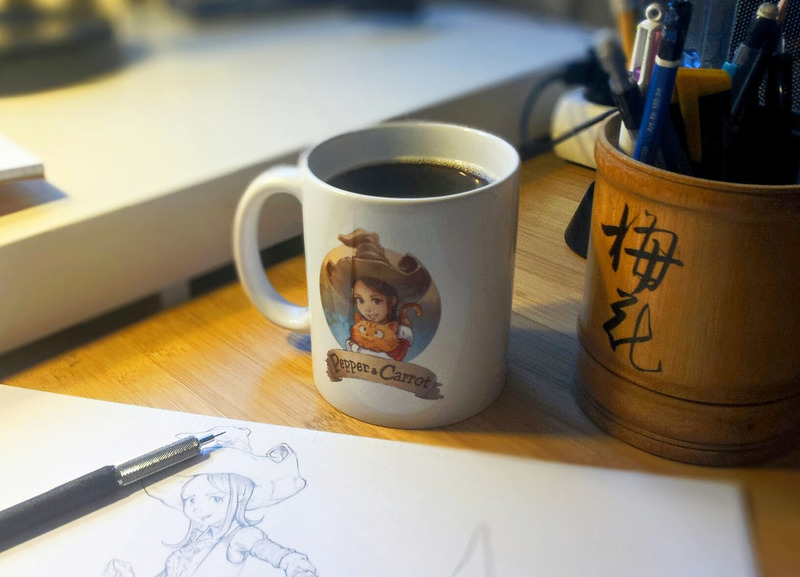 I start a quest to find the best online printing service for making a good official Pepper&Carrot mug. In the long term? Not only a mug but setting a good eshop with coaster, magnet, mousepad, tee-shirt...etc... Yes, this is the start of the quest for the official Pepper&Carrot eshop! This tests cost me money as I have to purchase the printed tests objects myself, and also take me time. It's a long term goal, and the eshop will not happen anytime soon: I need to wait for delivery, and test the product within a minimum time period (I'm trying to scratch print, boiling print, putting inside hot program of the cleaning washing machine ). But this effort is the price to pay to do things right and get good quality goodies. Something I want for Pepper&Carrot. Why: the service 'Vistaprint' was legit to test in first in my point-of-view: it's a cheap online printing service. The shipping packaging is resistant to any shock and the delivery was fast. The ink/varnish is stong to resisted to all my test so far. Color are good, and conform to the design and no color lost for the moment. The mug itself is pleasant with a basic rounded shape and feel robust. The price was cheap ( less than 10€ in Europe ). Not possible to setup a 'eshop' with my design and earn a little bit on it. I wouldn't recommends Vistaprint's service. I also purchased 100 postcards the same day, and the postcards are not thick enough and haven't got any guidelines printed on the back ( for the stamp, adress, etc ). It feels really cheap quality. I wouldn't say it's totally money wasted, but just really low quality compare to the price tag. I also was disappointed by the website and aggressive email marketing. It wasn't a nice experience to make a purchase on their platform. I'll not use this service to setup a Pepper&Carrot eshop! I setup a mug on deviantArt eshop here , the price is a bit higher and with the shipping oversea it's not a good deal for europeans and I guess africans and asians. I'll purchase one to see the result and I'll update this page as soon as I'll be done with all my test. If you also want to do it or have a recommendation ; let me know in the comment ! License: CC-BY David Revoy, www.davidrevoy.com, 7 november 2015 . Please also test the cups/mugs with black tea as it leaves heavy stains. @Michael Schaller : Ha true! thanks for the suggestion. @David I couldn't agree more with you report on Vistaprint. The problem is Vistaprint will own it so nobody else has a right on it. So they would violate the licence. The mugs are made in France and are good quality (véritable porcelaine). You could push your merchandise to this platform, which would be an advantage to all parties. You could ask them for advice. @libre fan : Thank you librefan and Frédéric ; good ideas to test them! I only tried out the vistaprint website, filling in my email address *without submitting*, and they still scraped it and are sending me spam. Fortunately for the krita merchandise the volume is low enough (and when high volume like the kickstarter rewards, it's all in one burst) that I can use a very good local business that really thinks along with us. @Irina : Thanks for the feedback! I also remember Krita had a contributor one summer who studied all e-shop / merchandising . I'll look in my email archive to see the result of her studies. @David, these people (framasoft and FSF-E) might give you some tips, of course I didn't suggest that FSF-E could offer you a platform, and Framasoft may be willing to upgrade their platform and make it bilingual. (BTW, I'm no Framasoft fan but lately they've been doing a good job for many people). Vista print is horrible for anything except for printed materials (business cards, greetings cards etc). I could warmly recommend spreadshirt. If you lived in the US I could do your printing for you, I would love a 600dpi image to work with, I usually have to GiMP in the details so it looks good on my jobs. 300dpi just doesn't do most art justice, and having studied the Masters, I can usually ape another artist's style enough to fill in the blanks, and then I have them check my work before I go to print.